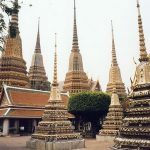 Buddhist temples are among the most important symbols of Thailand, partly because the majority of Thais are Buddhist. 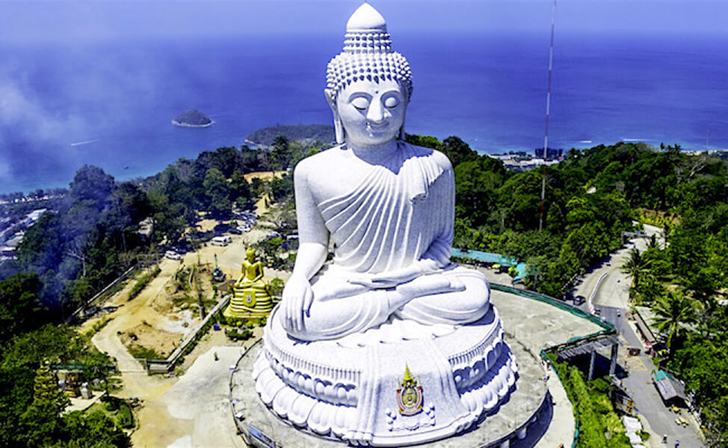 In Phuket alone, there are 29 temples spreading around the island. 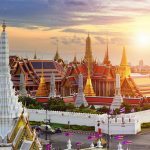 Whereas, the busiest and biggest one is the 200-year-old temple, Wat Chalong which is found on Chaofa West Road in Chalong, about eight kilometres south of Phuket Town. Wat Chalong was built in the early 19th century with the beautifully designed buildings and statues of Buddha in every window. Far from being a place of quiet contemplation, it is a lively and loud temple. 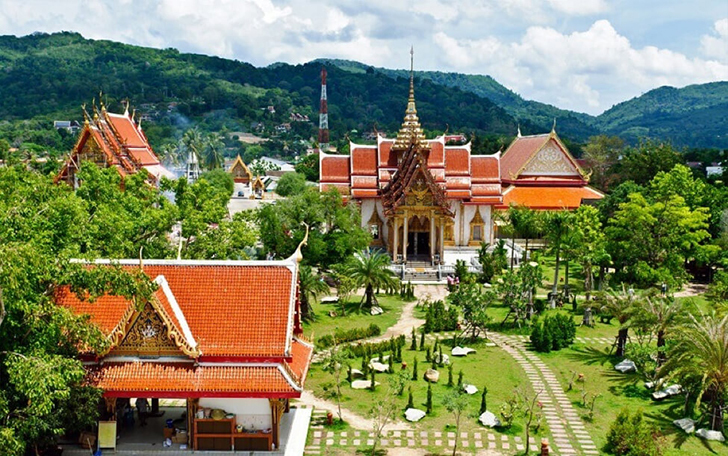 The large ground that is officially named Wat Chaitararam contains a viharn, a mondop, an ubosot, a chedi, a sala and a crematorium. Wat Chalong has a long history of being associated with healing. Two former abbots of the temple were known for their knowledge of herbal medicine and their healing for local people. Buddhist come to the temple to pay respect by lighting candles, offering lotus flowers and applying gold leafs to Buddha statues. They also pray for health, good luck and wealth. This temple is a major tourist attraction, so it is expected to see thousands of people from tour buses throughout the day. To avoid the tourist crowds, it’s best to visit Wat Chalong early in the morning or near the end of the day. For nine days during Chinese New Year, the temple is transformed into a bustling fairground for the annual Wat Chalong Fair. Worshippers stream through the temple day and night. In the evening, there’s live music and dancing entertainment, games, hundreds of food and local product stalls. It is not simply a pretty temple for tourists to take pictures in but a place of worship for Buddhists. Therefore, it is compulsory that a lady must cover up her shoulders, cleavage, and thighs when entering Wat Chalong. There are volunteers that happily hand out sarongs at the front entrance. On the opposite end of the spectrum, both men and women must take off shoes and hats before going inside the temple. Here is a list of some guidelines to follow when you enter Wat Chalong. • Do not touch or turn your back to an image of the Buddha. • Never point your fingers or feet at a monk or statue of the Buddha. • Don’t disturb the monks or others who are worshipping in the temple. • Turn the sound off on your phone, lower your voice, just be all around quiet and respectful as much as possible. • Do not touch any of the relics or sacred objects. • For all the Ladies, never touch a monk or his robes. From any of the beach resorts you can get Wat Chalong by taxi or tuk-tuk. Before you leave, be sure to agree on the price. You can book a round-trip tour, in which case the driver will wait for you to bring you back. Wat Chalong is open daily from 7 am to 5 pm. Admission is free, although donations are welcomed for the maintenance of the temple complex. Best day to visit is a weekday because on weekends and Thai public holidays, the grounds can get very busy. 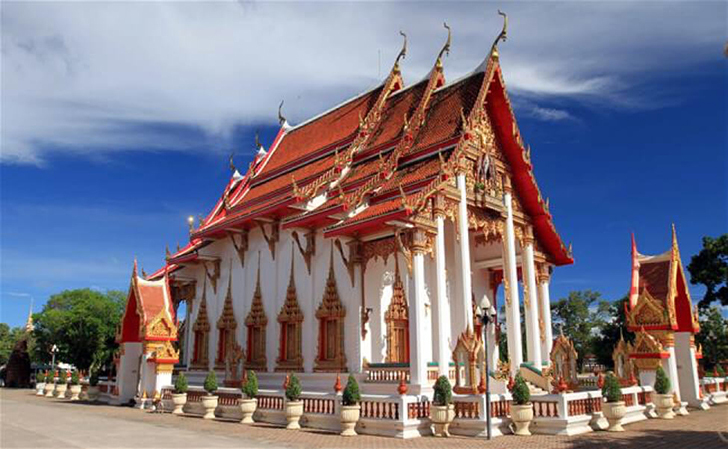 It’s certainly worth a visit to Wat Chalong since it’s among the most historically important temples to be found in the region. Don’t forget to put this temple into your list for the trip!